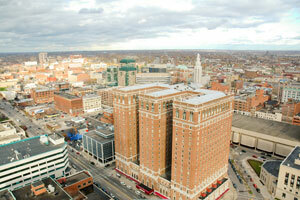 Buffalo is nicknamed the “City of Good Neighbors” and is home to over 250,000 residents. There are over 30 different neighborhoods within Buffalo creating a huge market for specialized local advertising to target your audience. Notable neighborhoods with effective advertising opportunities are Broadway-Fillmore, Central Park, Cold Springs and Delaware District. Buffalo is also home to universities like the University at Buffalo, The State University of New York. This allows for outdoor advertisements at cheaper billboard prices focused on the college audience. Additionally, billboards on I-90, I-190, I-290 or I-990 would generate high exposure of your business. Zip Codes: 14201, 14202, 14203, 14204, 14205, 14206, 14207, 14208, 14209, 14210, 14211, 14212, 14213, 14214, 14215, 14216, 14217, 14218, 14219, 14220, 14221, 14222, 14223, 14224, 14225, 14226, 14227, 14228, 14231, 14233, 14240, 14241, 14260, 14261, 14263, 14264, 14265, 14267, 14269, 14270, 14272, 14273, 14276, 14280.